Before I left for Alaska two weeks ago, I wrapped up a piece on glorious spring rhubarb that was published today in the San Jose Mercury News. The dish that pleased me most was this homey rhubarb clafoutis. A riff on the simple French cake frequently made with cherries, it’s at once tart, sweet and creamy. The bright, tangy flavor of rhubarb plays deliciously against the custard-like cake. The secret to its luscious texture is to not bake it too long. The finished cake should still be a little soft in the center when you take it out of the oven. 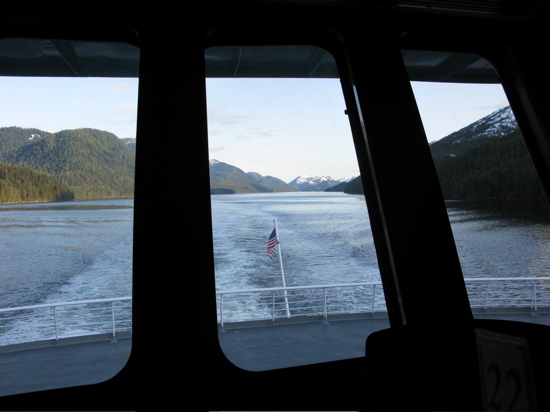 In the meantime, I’ve been sailing the Inside Passage on my way through Southeast Alaska. The ferries have proved a marvelous way to get a close look at this magical landscape of snow-capped mountains and dense green forests sweeping down to the sea. Eagles soar overhead and Pacific White-sided dolphins leap out of the water. I’ve yet to see much of whales aside from random spouts in the distance, but we haven’t reached Haines. There’s still plenty of time to encounter a pod of humpbacks. One of the things I’ve been looking forward to most is the taste of fresh salmon straight out of Alaskan waters. 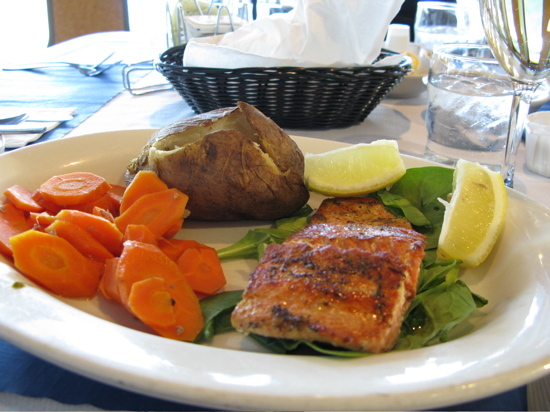 Since the salmon season was cut short in Northern California, I haven’t had any of my favorite fish for months. Even if I weren’t opposed to farmed salmon on principle, I wouldn’t consider it an acceptable alternative. Its flavor just can’t compete with that of its wild cousins. I was so eager for the real thing that I took a risk and ordered it in the ferry’s dining room. I should have known better, considering all my years as a restaurant critic. Although the fish looked promising, it was overcooked, excessively seasoned and utterly disappointing. At least the view was fabulous. My mission now is to buy some fresh salmon – off the docks if possible – and cook it myself. I’m thinking about steaming fillets en papillote, or, more likely, in a foil packet. I’ll let you know how it turns out. Since the link to the story and recipes has expired, I’ve added the clafoutis recipe. Preheat oven to 400 degrees. Trim rhubarb, removing any coarse strings, and slice into ½-inch chunks. Place rhubarb in medium bowl, sprinkle first with Grand Marnier and then with 1 tablespoon sugar. Toss to coat pieces and set aside. In a food processor, whirl together ½ cup sugar, eggs, cream, melted butter and vanilla. Add flour and process until smooth. Butter deep dish pie pan and pour in enough batter to cover bottom of pan. Distribute ¾ of the sugared rhubarb over the bottom and cover with remaining batter. Arrange remaining rhubarb over top and sprinkle with 1 tablespoon sugar. Bake for 20-30 minutes, until top is deeply browned and the sides are set but the middle remains slightly soft. Cool for at least 10 minutes before serving. Strange that rhubarb is so hard to come by in the States… I remember buying it in the spring in the Safeway always in DC. And here in Stockholm, rhubarb crumble with butter and oats and cinnamon and sugar and lemon and grated marzipan (which they call crumb pie) is a real standard and most people have patches of the plant at their country houses. Kids are even known to chew on the the raw stalks. My mother used to dip it in sugar as a kid and have a rhubarb stalk as a real treat! My grandparents liked it best just stewed and in a bowl. Amazing all of the different things we can do with it. 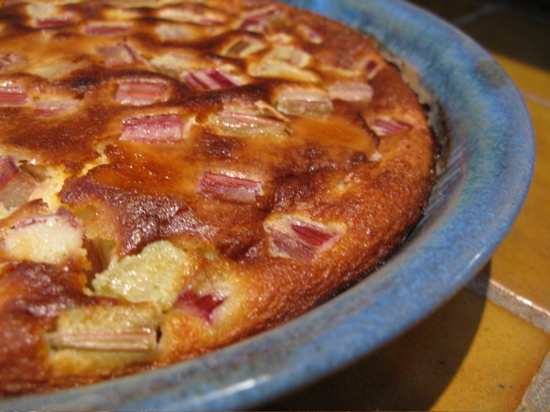 Would love the recipe for your rhubarb clafoutis. It is no longer available from your link. I didn’t realize the link no longer worked. I’ve added it to the post. Thanks for bringing it to my attention.